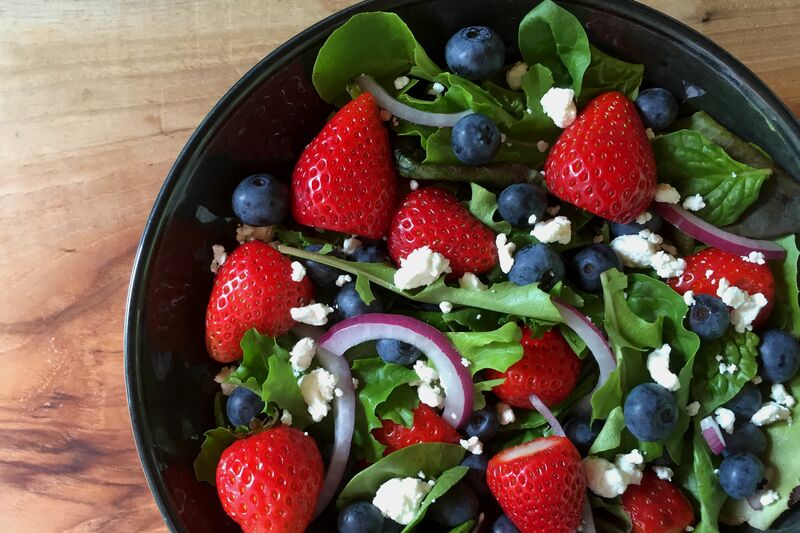 Martha’s Vineyard Salad is a wonderful salad made with baby greens, fresh strawberries, blueberries, and goat cheese. I call it Martha’s Vineyard Salad because I first tasted it in Edgartown, which is a quaint little town on the island of Martha’s Vineyard. My niece Samantha and I decided to treat ourselves to a nice lunch after a morning of shopping and found this pretty little restaurant that had window boxes filled with purple and yellow flowers. Looking through the menu we spotted this salad and knew it would be fabulous. 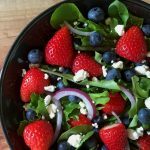 The flavor combination of the sweet berries with the tangy goat cheese is fantastic, and I knew I had to recreate this salad at home. Needless to say this is now one of my family’s favorites, especially in the summer. It is easy to make and extremely versatile. In the past I have substituted the berries with ripe peaches, cherries or whatever fresh fruit looks good at the market. Sometimes I add in candied pecans if the mood strikes me. My advice is to follow the basic recipe but feel free to make it your own. I have not included measurements in the recipe, but really, who measures out ingredients for a salad? Just trust your judgement and it will be fabulous. I love to serve it with a balsamic dressing. Cut off the tops of the strawberries and then slice them in half or quarters depending on the desired size. Slice about 1/4 to 1/2 (depending on the size of your salad) of a red onion - very thin. Toss with a small amount of balsamic vinaigrette directly on the salad right before serving; taste and add a little more if it needs it. Do not over dress the salad. Cover and refrigerate any leftover vinaigrette for another day. In a small bowl whisk together the balsamic, Dijon, salt and the pepper. Slowly drizzle in the olive oil while whisking until it comes together. Taste by dipping a piece of lettuce into the vinaigrette and adjust the seasonings if necessary. Looks amazing and simple to make. I think I’ll make it for my Labor Day guests !